Telescoping back scratchers measure 6.5 inches long when fully closed and can be pulled out up to 20 inches long. The durable stainless steel construction will last for years. 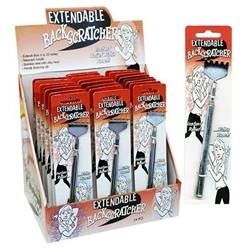 These back scratchers are a great gift item for people with limited mobility. Use to reach and scratch an itch anywhere on the body. Slip on clip makes these back scratchers easy to clip on shirt pockets, purses, etc. Great also for reaching objects that are far away. It's like extending your fingers by 20". Each box contains 24 extendable back scratchers which are hang-able for retail sale.